The flames of the console wars were lit once again in March of 2019 during a Google event in San Francisco. As part of the Game Developers Conference, the tech giant revealed Stadia, a streaming platform with its eyes set on competing with Sony, Microsoft, and PC gaming. We’ve heard rumblings of this in the past years, along with a test of the concept using Assassin’s Creed Odyssey, but now that the cat’s out of the bag, it’s time to see if this new platform could really go toe-to-toe with the PS5. We all knew that Google was working on something gaming related, ever since the rumors about something codenamed Yeti emerged in early 2018. Their test of the technology, entitled Project Stream, went fairly well with Assassin’s Creed Odyssey, but it wasn’t until March 2019 that we would hear about the final concept. The final name is Stadia, a fully streaming platform that promises to provide quality experiences streamed directly to your phone, tablet, laptop, or TV. Google is creating a controller for the experience, but in many cases it won’t be required. There’s a lot to break down from the announcement, so let’s dive in and check it out! You won’t be bringing home a console when Stadia launches sometime in 2019. In fact, the most you can buy from a hardware perspective is a controller and a Chromecast if you’re on a TV. The controller itself is pretty standard fare, but it does feature a Google Assistant button that allow you to request YouTube walkthroughs should you find yourself stuck in a game, and a share button that we’ll cover shortly. Everything is streamed to your devices from Google’s servers, of which there are many. They argue that these endpoints will ensure the experience is smooth for anyone, but internet speed wasn’t addressed in today’s conference. The idea of a “Netflix for games” is in full swing here. Could you imagine never buying a disc or waiting on a download? Google promises instant access to titles, with only five seconds to wait before you’re in the game. I myself couldn’t see switching to this kind of format entirely, I love my consoles too much, but if the idea works as well as they say, it would be quite interesting to experience. 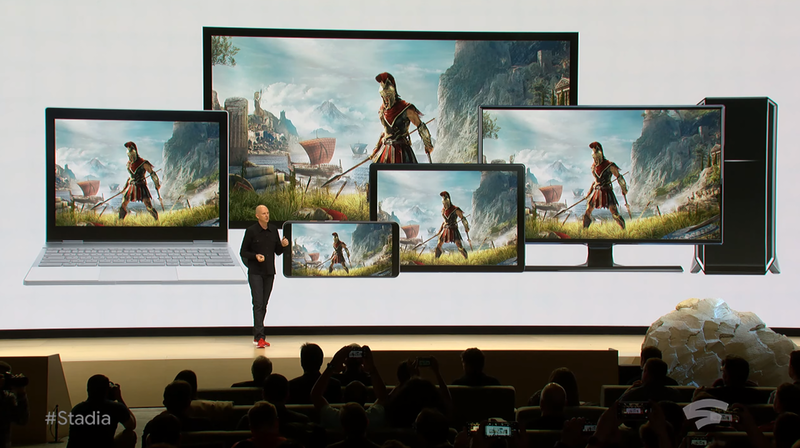 We saw a few familiar faces during Google Stadia announcement, including Phil Harrison who used to work for both Sony and Microsoft. He introduced the head of Stadia Games & Entertainment, which is Google’s studio for exclusives and first-party titles. Her name? Jade Raymond, known for creating the Assassin’s Creed franchise during her time at Ubisoft. Having access to first-party titles could be a game-changer if Google brings us top quality experiences you can’t find anywhere else. They also confirmed that Doom Eternal would be available on the service, running at 4K and 60FPS, so it seems all the major titles will be present and accounted for on Stadia. Still, they would have to compete with Sony’s exclusives, which have yet to be topped by other competitors. Even so, the creation of a studio like this is a smart move on Google’s part. Performance will continue to be a hot topic as we learn more about Stadia, but Google is promising 4K, 60FPS and HDR support at launch. Of course, this kind of performance will most certainly require a very strong internet connection, but the company even bragged about scaling up to 8K and 120FPS in the future. I know what you’re thinking. How could they possibly push out this kind of performance? They have a little help from AMD and some serious server specs. Since you’re streaming games from a server, there’s a lot more potential for hardware than a set console. Google even went on to describe how multiple GPUs can be utilized at once to boost graphic detail and effects. That being said, the base specs for these servers are far above what we have now. They even compared their GPU to the ones found in the Xbox One and PS4. Talk about fighting words. It’s possible that PS5 could employ similar specs, but you won’t be able to string together multiple PS5s (that I’m aware of), so Google will still have an edge there in terms of specs. Many of the presenters at the Stadia announcement were showing proof of concepts that were implemented using tech demos to illustrate their point. One such demonstration was State Share, presented by Q-Games founder Dylan Cuthbert. The idea here is that you can capture a moment from a game, down to your inventory, health, and current state, and share that with others. Developers can choose how detailed they want it to be, but it would essentially allow you to jump into the exact moment from a stream or speedrun and try your hand at the same scenario. It’s way beyond simply sharing screenshots and video. What’s even crazier is that you can share it via a link. People click the link, load in, and relive that moment. For streamers who want to engage more with their fans, Crowd Play allows viewers to jump into their multiplayer match and play alongside them. The example shown was an NBA 2K game, but the idea could work for anything. A simple line system keeps track of who is up next to join the game and allows you to jump in with the click of a button. You could be watching the stream on YouTube and playing the game yourself without moving from your computer. All in a matter of seconds. 7. The Resurrection of Local Co-Op? One proof of concept that really floored me was the idea that developers could implement split-screen or multiple perspectives at once without losing performance. Modern consoles can’t handle split-screen in many cases because they can’t run the same game on two screens at once. This solution would allow developers to harness multiple servers as needed to run the game in a single instance. If it’s embraced, developers could easily implement couch co-op in just about any game. As someone who games with their significant other, this would be huge. How Will Microsoft and Sony Answer? Alright, so with all these fancy gimmicks aside, where do we stand? Google’s Stadia is incredibly impressive, in theory. All of the ideas at play here sound amazing, but we still haven’t heard how they plan to combat poor internet connections. More importantly, what’s the minimum speed you need for a 4K, 60FPS experience? I imagine it’s going to be pretty high. There’s also the fact that Microsoft is pursuing a similar goal with their Project XCloud announced at E3 2018. Sony, meanwhile, has done very little streaming outside of PlayStation Now. Will they jump on board or stick to strong hardware? Gamers aren’t ready to leave the physical world behind, but I personally wouldn’t mind seeing what Google can do with this idea. Will Stadia compete with PS5? It will certainly try, and if anything, the battle will be legendary indeed.